Some conflicts are inevitable. Chief among them is who does the dishes, followed closely behind by "WHY IS THERE NO MILK?!?" It would be great to end up a world-famous author or lawyer, but there are days when my ultimate success is simply to avoid both leaving the house and ordering takeout. Enter, Chicken with Sun-dried Tomato and Basil Gravy, a miracle of resourcefulness and no-dishes-ness. With these meager, somewhat stale ingredients, I created deliciousness and only two dirty pans. Let me tell you how to do it, because you shouldn't have to leave the house either and dishes are for suckers. First, lay out three paper plates assembly-line style with the bread crumbs in the middle. The first plate needs a hefty scoop of sun-dried tomatoes and shredded cheese. Next, slice through the largest part of the chicken breast. I don't have a picture because I'm scared to death of contaminating my phone with chicken juice. Old vegetarian phobias die hard. 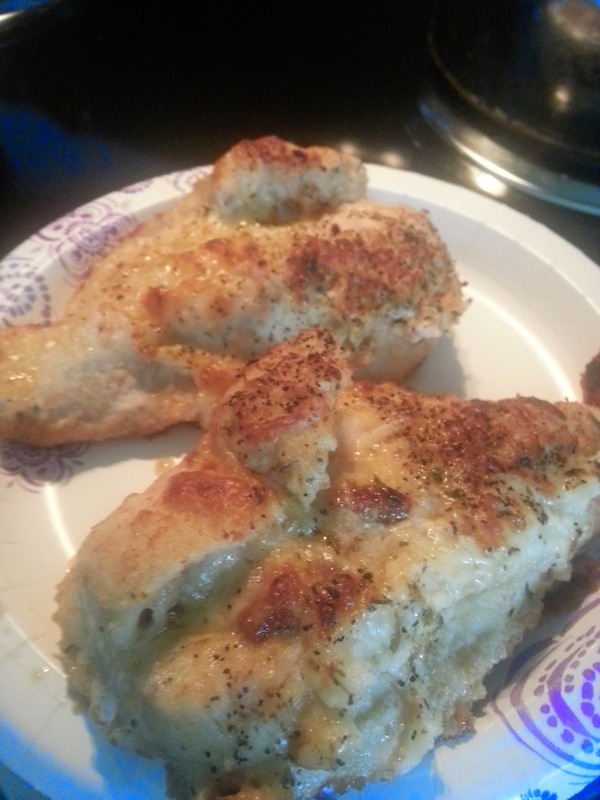 Shove the tomatoes and cheese into the chicken. Don't be too eager, since you still want it to close. Dredge the chicken through the bread crumbs. Place the coated chicken on the third plate. Repeat. Wash you hands. For god's sake! The juices! Ok, in a large skillet over medium heat, pour some olive oil and some of the oil from the sun-dried tomato jar. Place the dried basil on the skillet and let the two infuse. Add the chicken breasts. 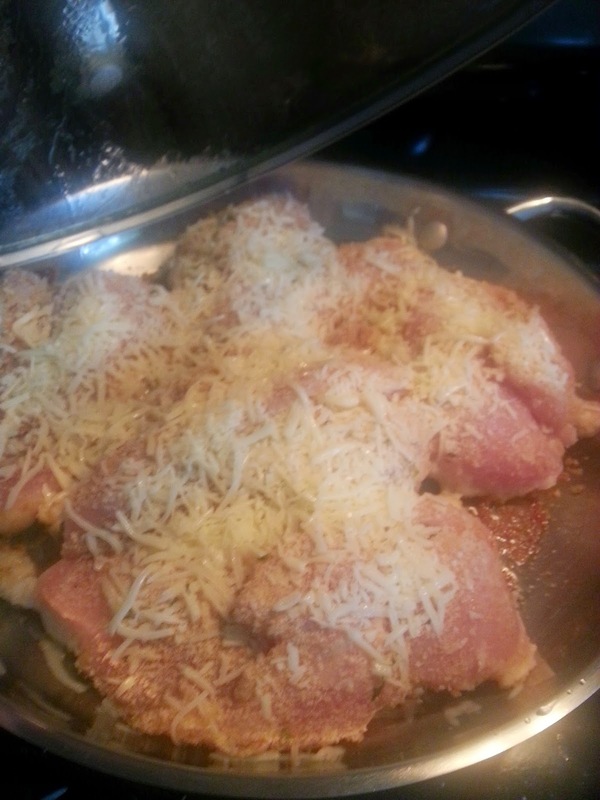 Top with the remainder of the cheese and the seasonings. Cover. Cook until the breasts are no longer vectors of disease. Don't worry if they touch. While the chicken is cooking, chop of the tomato. Once the chicken is done, remove it. Store on a paper plate while you make the rest. Scrape all the little chunks of goodness into the drippings. Add the chopped tomatoes to the pan. 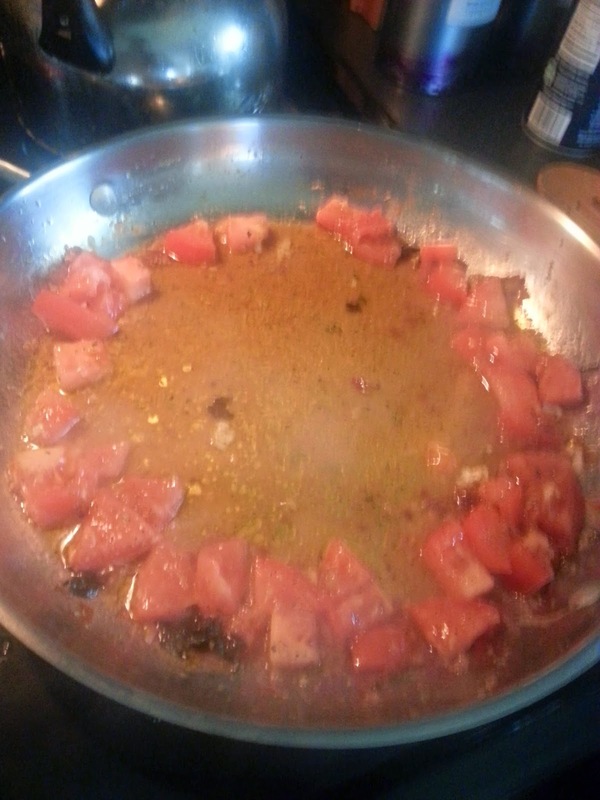 Let them cook in the drippings a bit, then move the tomatoes to the edge, like they were about to start a dance circle. Who is going to do the bump? Add a sprinkling of flour and immediately begin stir it into the drippings. 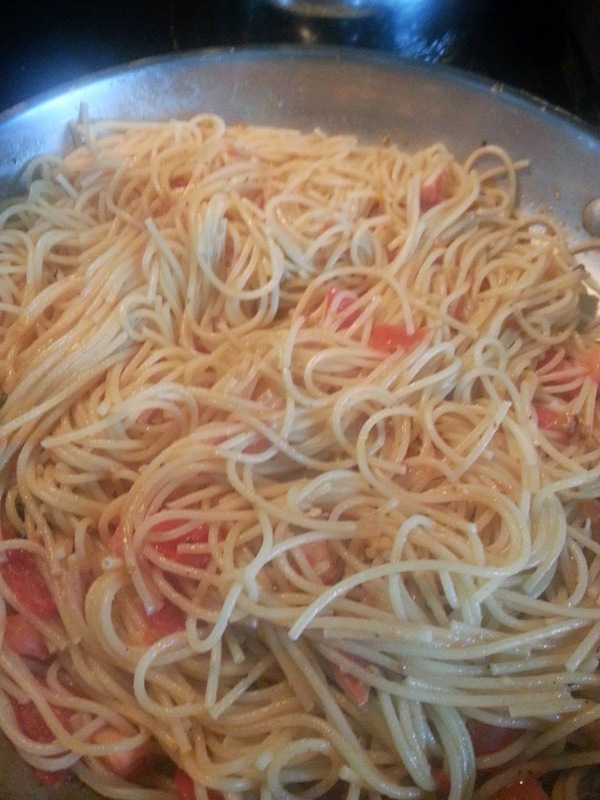 If the tomatoes weren't juicy, you may need to add water or broth (which I didn't have). When you have a smooth paste, mix in the tomato chunks. Cut the heat. Make the spaghetti according to directions and drain. 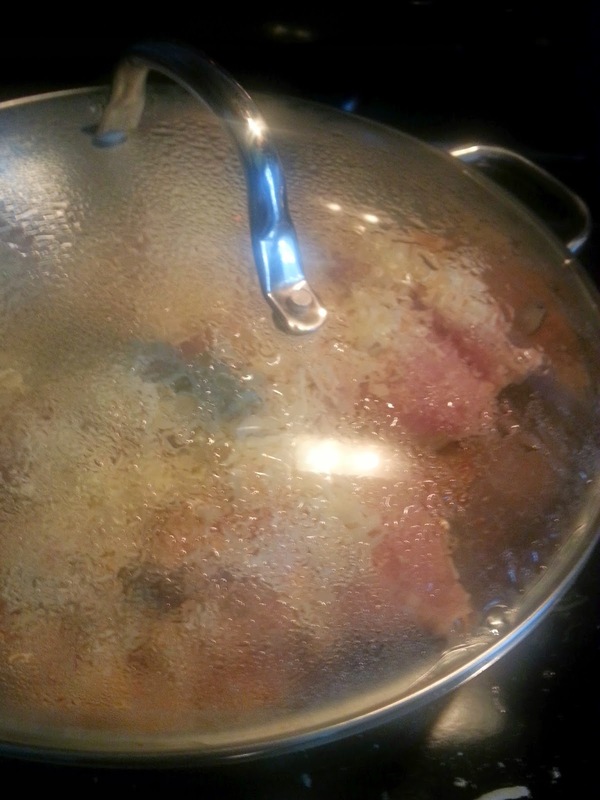 Add the spaghetti to the saucepan with the gravy and mix together. Add more oil or butter if you have it. Sprinkle with sea salt. That's it. Serve it up. The nice thing about this recipe is that it stores well and the chicken makes delicious sandwiches the next day (and the next). You also have only two pans to wash and no dishes. And really, the spaghetti pan is like a half-wash.
Could you have used dishes and saved a tree? Sure. Could you have replaced the chicken with tofu and saved a chicken? Yes, but you won't get the drippings, so use more seasoning and oil. Maybe vegetable broth. Did your ingenious plan result in Mr. Shiftless doing the dishes? No. The dishes remained. But at least there were less of them. Why are your pictures blurry? My phone is awful. Here's a Shiftless Quickie: Never buy last year's model.